So I made mention of this recipe a few weeks ago via facebook and instagram, but am only now getting around to sharing it with the rest of you. I will be getting into some details about what exactly is keeping me so busy lately in the next few days, but for now you’ll just have to settle for this. And when I say settle, I mean you should be prepared to drool a little over it. Unless you hate springtime, and strawberries, and rhubarb, and other such lovely things. Which would be weird, you know, since Spring is the best. But I digress. I usually love nothing more than a Strawberry Rhubarb Pie, but I went the crumble route this time for a bit of a change. Ahem. Ok, that’s not really true. I needed a breakfast that I could eat on all week and I thought crumble sounded better than pie. Crumbles have oatmeal toppings and stuff, and oats are definitely healthy and breakfast-esque. Call it whatever you want, but I’m just gonna call it delicious and let you decide which meal you want to add it to. Oh! You may have noticed that I added basil to it. Well, that’s an interesting story, actually. See I had just poured all these beautiful strawberries into my baking dish and I noticed a piece of a strawberry leaf stuck to one of them. In typical Emily fashion (easily distracted) I thought “Hey, that’s pretty. I wonder if I have any herbs to throw in here…” Turns out that the only herb I had was basil, and I kind of thought that might not be too bad. And it was actually awesome. 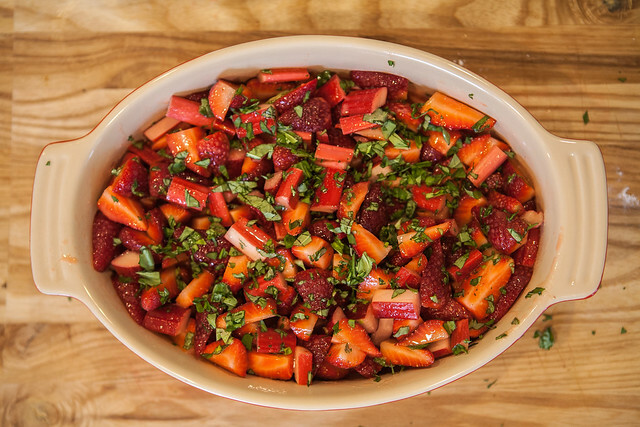 The bright basil flavor perfectly balanced out the sweet strawberries/tart rhubarb, and I felt like a total genius. So go out and try something new. It might be awesome. Also, try this, because I can guarantee that it is. Topping: In a mixing bowl, combine flour, baking powder, sugars and lemon zest and add the melted butter. Mix until small and large clumps form. Refrigerate until needed. Filling: Toss rhubarb, strawberries, lemon juice, sugar, cornstarch, basil, and a pinch of salt in a 9-inch deep-dish pie plate. 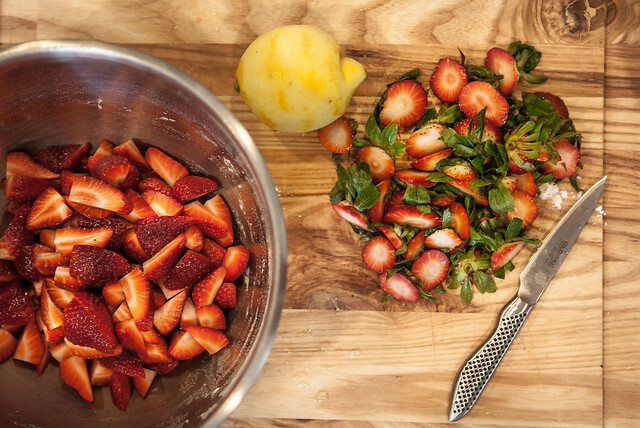 Remove topping from refrigerator and use your fingers to break it apart over the fruit. 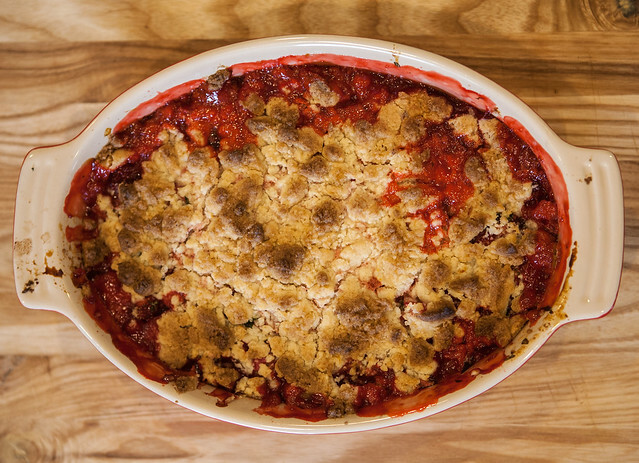 This part doesn’t have to be pretty – just crumble it over top and it will spread out as it bakes. Place baking dish on a foil-lined baking sheet, and bake until crumble topping is golden brown in places and fruit is bubbly, 40 to 50 minutes. *I usually like to be very clear where I’ve gotten my recipes from, but in this case, I have no idea from whence it came. 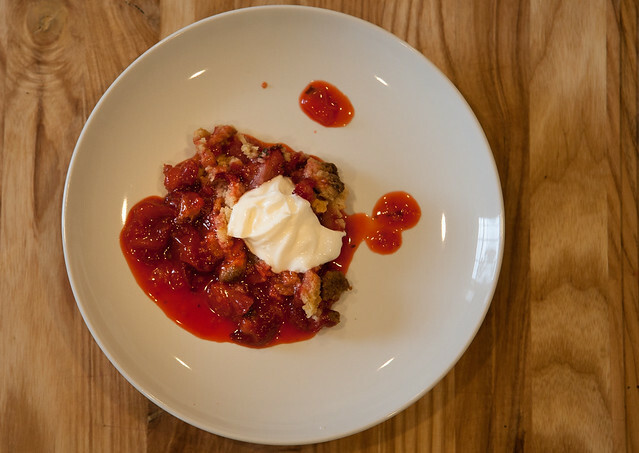 I had this recipe saved on my hard drive simply as Fruit Crumble and I haven’t the slightest whom to credit it to. If it looks familiar (like I may have plagiarised it from you) do drop me a line and I’ll be sure to give credit and link back.